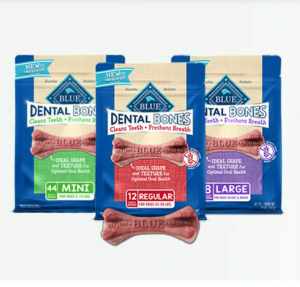 Fill out the form to get a coupon for $1 off your next bag of BLUE Dental Bones! BLUE Dental Bones have the ideal shape and texture to help clean dogs’ teeth and freshen their breath for optimal oral health. With a variety of sizes from mini to large, these wheat-free chews are made from high-quality, natural ingredients and are enhanced with added minerals. Clean teeth and freshen breath with tasty, longer-lasting Dental Bones! This coupon is available in Mailed Format.